In case you’ve missed my posts for my development process for making Incident at the Game Store, here’s an index of links to all the parts in the process. I hope that any aspiring comic makers will look through my articles to learn how to make comics themselves. Good luck and keep drawing! Categories: Blog, Comics, News, Tutorials | Tags: #Incident at the Game Store, Art, Comic, Index, Tutorial | Permalink. The inking is done, the lettering is done, everything is nearly done! Now it’s time to put it together for printing and showing off!! 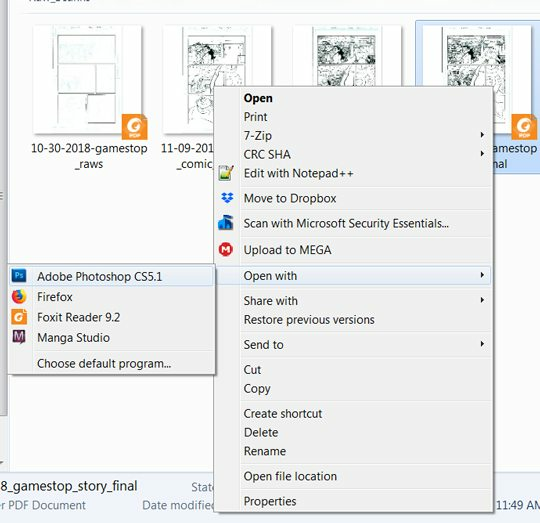 At this point I can go two ways: I can set up the for printing physical copies or I can set it up for sharing and downloading online, phones, or tablets. For the moment though, this is how I set it up for full resolution 300 dpi printing and general purpose use. So when setting up for printing, I use Ka-Blam for printing my comics. I make sure to adjust and build my all of my comic pages to their specifications. They’re even nice enough to provide a template they use for printing and cutting. 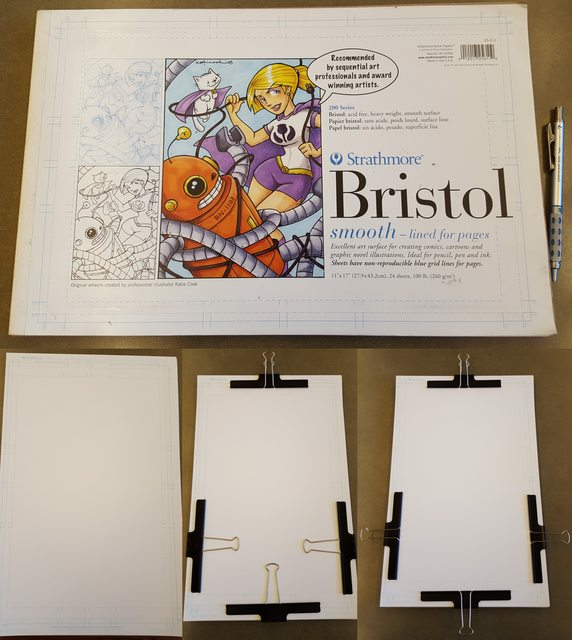 Arrange your art to this template and shift and scale the edges of your panes; to the edge of the live and margin area. 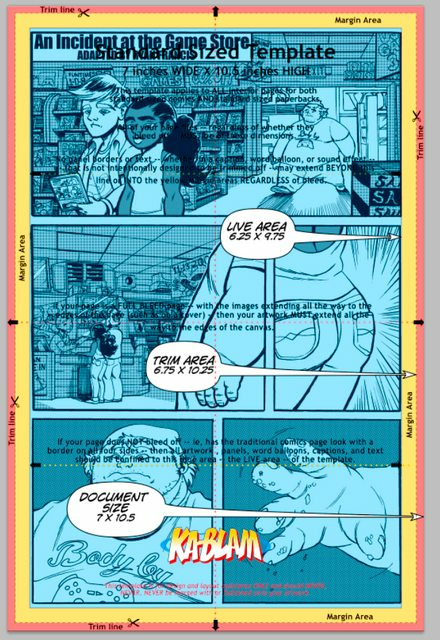 Keep all of your pages in that same document so you can use the Multiply Blending Option or Lowering Opacity to keep the panels and art uniform in proportions between pages. I have all of my pages gathered from the start to export. First, I begin in Manga Studio by Exporting a Single Layer as a PNG file. Make sure you make a New Folder somewhere you can find it and name it something consistent and memorable so others can find it and access it for printing out. Categories: Artwork, Blog, Comics, News, Tutorials, Work in Progress | Tags: Art, Comic, Tutorial | Permalink. This was originally going to be in the digital touch ups step of my series of articles of my comic process, but it was getting a bit long, so I broke this into a separate article! It’s time to utilize Manga Studio to do something personally experimental. I’ll be adding screen tones to give some of my art a grey tone with only black and white dots. I’m mainly working from a tutorial on screentoning from Whyt Manga. Also check out his comic, Apple Black! 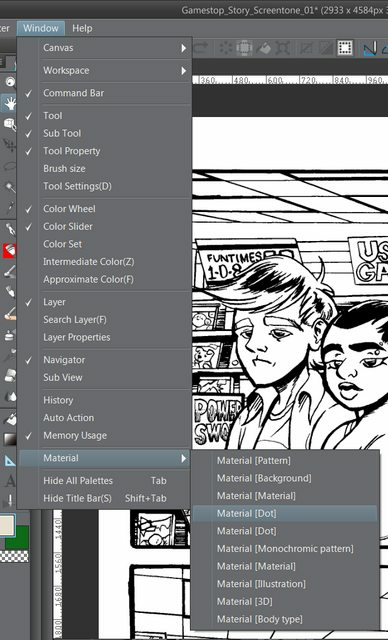 In Manga Studio 5 EX there is a Material Tab. 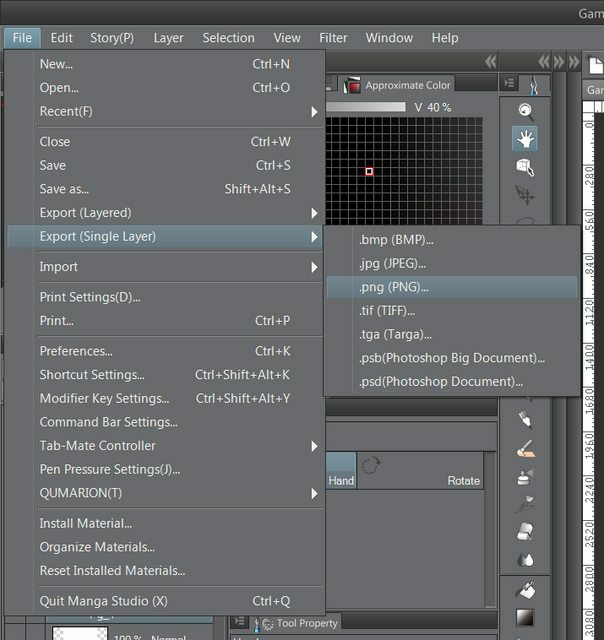 It would be in the default UI but if it is not, it can be accessed from Window>Material>Material[Dot]. You will find a variety of textures and screen tones from this tab, and you can make custom ones, which is what I’m doing. Categories: Artwork, Blog, Comics, News, Tutorials, Work in Progress | Tags: #screentones, Art, Comic, Tutorial | Permalink. I’ve finished my Inking and it’s time to touch up my stuff. It’s more or less my technique of how I edit black line art on the computer. 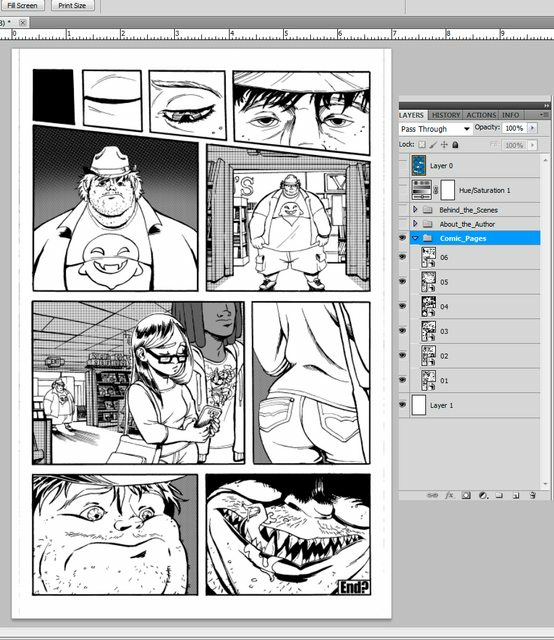 I usually scan my pages in a PDF format at 600 dpi and I use Photoshop to import the PDF pages. Categories: Animation, Blog, Comics, News, Tutorials, Work in Progress | Tags: Art, Comics, Tutorial, Work in Progress | Permalink. It’s inking time! Since I’m inking my own art, I blue lined my pages making it faster to get to the inking! I want to ink this comic with the nibs that I have at hand: a Speedball #513EF Nib, Zebra Manga G nib, and a Speedball #101 Imperial nib. I still have a holder from my crappy set of Speedball calligraphy nibs. I’m not sure if the holders make that huge of a difference other than being able to hold certain sized nibs, so I wouldn’t know if this it’s any special. I use all of this with a large 16 FlOz Bottle of Blick Black Cat Waterproof India Ink. Categories: Artwork, Comics, News, Tutorials, Work in Progress | Tags: Comic, Ink, Inking, Tutorial | Permalink. Writing these tutorials is a bit of an undertaking but I’m doing my best to be as clear and informative as I can so let me know in the comments if there’s anything you need help with. 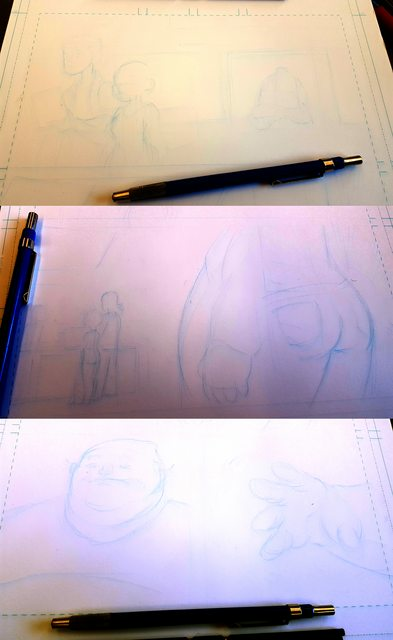 After grabbing ups some references, It’s time to get started laying out the comic in the big paper! At the start I’m marking down the rough areas of composition with non-photo blue pencil. This part is a bit newer addition to my workflow as I’m testing my ability to do this quickly. I’ll admit it’s a bit hard to see in a photo but I’m doctoring the photo in these demonstrations to hopefully be easier to see. Categories: Artwork, Blog, News, Tutorials | Tags: Art, Cartoon, Comics, Drawings, pencil, Tutorial | Permalink.